Imagine yourself deeply wrapped in a fluff of cloud. This soft sheath which is light but warm. This pristine white draping that’s holding itself in air. You could be God’s own child floating on a cloud. That’s the expectation some people have from their comforters. They also expect them to shield them cookie monsters at night and fight off ghosts. Comfort might be relative. But everyone has certain common expectation from their down comforters. We separated those from fantasies and brought you the 10 most comfortable down comforters in the market. These lie across a large price range and vary in their quality. Which are the most comfortable down comforters? Warm sleepers: There are some people who can sleep at a campsite with the sleeping bag open. They never need sheets and use paper-thin comforters. In short, they don’t feel so cold while sleeping. While they seem like the very spawn of devil, it’s just the nature of their body. These people require lighter, less warm comforters. They might be prone to sweating profusely too, so they need a highly breathable down comforter. Cold sleepers: These are the poor folks shivering under 10 layers of bedding. They are the ones tugging the sheets towards themselves and leaving you out in the cold. Cold sleepers need lots of warmth even in the summers. They like the comfort of a down comforter even in the sweltering heat. They will find the fluffy, moderately heavy comforters more comfortable. So pick between a light and a heavy-duty comforter based on what kind of sleeper you are. Weather: Which type of weather are you planning to use the down comforter in? Are you looking for an all-seasons comforter or just one for the winters? Tropical climates are warm and humid. You might not need a comforter at all. Subtropic residents may need a light down comforter with low fill amount and fill power. Temperate climate sees more variety in temperature. So you might need a truly versatile down comforter, one that feels light in summer but is warm enough for winter. There are some customizable comforters that can be snapped together into two layers. For more brutal winters moving to the polar area, you might want a really heavy-duty layer. We have also written a complete guide about best Down Pillows. Fill: You can have duck down or goose down filling. Duck down is affordable although not very fluffy. Goose down filling is fluffier. It is either similarly warm or warmer than the same quality of duck down. Check for the percentage of down in the fill. Down is warmer than feather, so higher the percentage of down, the warmer the comforter will be at lower weight. Fill power: Fill power is the measure of warmth of an ounce of down. Higher the fill power, the warmer 1 ounce of that down will be. Anything above 550 fill power is above average. 450-550 is average fill power. 700+ is excellent. Shell: The shell of the down comforter makes contact with your skin. Cotton is the best most breathable material for shell. Check the thread count. Higher the thread count, the better it will lock down the down inside the comforter. But too high a thread count may make it less breathable. Damask and Sateen cotton are high quality. Cambric cotton is affordable and has high value for money. Batiste cotton is highly durable and lightweight. Plushness: One of the most discussed feature of down comforters. Everyone wants a fluffy comforter. Even if a thin comforter provides enough warmth, users want to feel the richness of a plush comforter. Perception is everything. Maintenance: Maybe the fluffiness of the down comforter doesn’t last very long. It might have to be dry-cleaned regularly. This is a pricey affair and you many end up compromising on comfort. Try looking for machine-washable comforters. Warmth: The primary point of a comforter is warmth. We checked the quality of filling of the most comfortable down comforters. The fill amount and fill power were taken into account. Some of the choices are lightly warm for all seasons. Some are heavily armed to work in the moderate and harsh winters. Comfort: The comfort of the down comforters depends on many factors. We checked that these were lightweight and easy to handle. The fluffiness was a major concern while selecting the best. We looked for well-ventilated comforters. We checked how well they filled out the duvet cover. Shell: The shell of the best down comforters is their second major component. We checked that it was made of quality fabric and didn’t allow down to escape from the comforter. We noticed the noise of the fabric when it moved and the way it felt against the skin. Features: Any convenience features like duvet cover tabs, side piping, baffle box construction, snap system to extend the comforter all earned special brownie points. Budget: We have spread our top picks around a wide range of price. We compared the down comforters from various price ranges based on their value for money. The Egyptian Bedding Luxurious goose down comforter is a stellar product in every sense. It is plush with a generous amount of top-notch filling. It does not compromise with warmth even though it remains lightweight throughout the journey. The shell is made of premium fabric to round off that soft and pleasant feel. There are a whole slew of choices in sizes too. And all these features are packed in such a reasonable price that we literally ran at it with the top spot of our most comfortable down comforters list. The Egyptian Bedding Luxurious goose down comforter is filled 100% goose down. This type of down is fluffier than duck down. This is 750+ fill power down at 50 ounces in King size. There are four sizes. The Twin size is 68” x 90”. The Queen size is 90” x 90”. The King size is 106” x 90” and the Californian size is similar. It is heavier than all-seasons comforters for subtropical climate. But it’s not sluggish. You can move it around with much strain to your arm or back. This comfortable down comforters is sheathed in a pure cotton shell. This is hypoallergenic 1200 thread count cotton. This ties the down inside the shell and keeps the feathers from escaping out of the shell. The shell has a double-needle stitch on the edges. The edges of bedding are usually more prone to damage because they tend to graze the floor. This stitching makes sure that the edges don’t tear. The best course is to dry-clean this comforter. But you can also wash it in lukewarm or cold water by hand. Or you can put it in the machine with a low-suds detergent and run it on low temperature. We suggest using a duvet cover which is easier to clean. This Egyptian Bedding down comforter has duvet cover tabs on the edges which help you secure the cover and keeps the comforter from piling inside. The down has been packed with a baffle box construction. This helps keep even the edges of the squares warm. The down does not move easily between boxes. The Egyptian Bedding goose down comforter arrived slightly flattened. It time, it fluffs to its full size. This is a rich comforter that covers you in its plushness. The down is uniformly distributed inside the baffle pockets. So you remain warm no matter which part of it is covering you. There’s no down shedding, so maintaining your bed is easy. You can use it through moderate to bad winters and in cool seasons like autumn. In summers, it might be a bit warmer than you bargained for. There’s a faint odor when it first arrives. You can air that off by hanging it in fresh air. There’s some scrunch to the cotton cover which you can hear when you move it. It goes away with the first wash or with continuous use. We mentioned how we have covered some light all-seasons down comforters as well. The Royal Hotel light down comforter is one of those. This can be used year-round without the stuffiness that you encounter with heavy down comforters. It is available in a full array of sizes. The fill power is good and the cotton shell is durable and well-ventilated. The assurance of zero down shedding and striped design is what ultimately led it to the most comfortable down comforters list. The Royal Hotel’s light down comforters derives its warmth from a 100% fill of goose down. There’s no adulteration with feathers here which gives it the lightweight and warm character. The down used is of 600+ fill power. The Queen size is 90” x 90” with 36 ounces filling. The Twin size is 68” x 90” with 28 ounces of goose down. The King size measures 106” x 90” with 40 ounces filling. The overall fluff level is kept medium to get you through the cool summer nights. This comfortable down comforter is draped in a hypoallergenic cotton shell. This 300 thread count fabric allows air to move freely through the down and to your body. It is effective at keeping the down where it belongs, on the inside. The shell also prevents down allergy. The construction is sewn-through box stitching which keeps the down from travelling down to one side at leisure. The manufacturer suggests this is dry-clean only. But other users have thrown it in the machine with good results. We suggest suing low temperatures as much as possible. The down comforter may feel a little too flattened at the beginning. It takes 4-5 days to regain its full loft. Otherwise you are pop it in the dryer with a tennis ball and watch it inflate miraculously. The Royal Hotel’s light down comforter is for summer to moderate winters. It is lightweight and easy to tug around as you go through a million positions in your sleep. It’s not ultra-plush like heavy-duty comforters. But being all-seasons we expect its medium-warmth protection. It is definitely much warmer than it looks so it didn’t disappoint us there. For warm sleepers, this one is especially well-ventilated. You don’t get muggy underneath it. A duvet cover would be a nice addition but you can do without it because of the unofficial machine-washable status. We haven’t heard any report of down-popping so those with allergies can trust this one. Pacific Coast is a very well-know brand as far as down comforters go. Their reliability is the stuff of dreams. The European down comforter carries the hallmark of their invincible quality and durability. This is a high fill power year-round comforter that is equally liked by warm and cold sleepers. The ease of maintenance as recommended by Pacific Coast is also unbelievably easy on the user. It gracefully twirls into its top place in the most comfortable down comforters list. The Pacific Coast European Down comforter detours from tradition and uses Pyrenees goose down. This is exotic filling found in the Pyrenees mountain region of France. This has larger plush down clusters that lend a high loft to the comforter. The down is properly processed to reduce chances of down allergy. This 650 fill power down provides all-seasons warmth. The Queen size is 90” x 98” and packs 34 ounces of the down. This comfortable down comforter uses baffle box construction. The down is trapped within 6-sided boxes that help maintain the loft as original and prevent piling of down. The shell is made of 420 thread count Egyptian cotton. This has a nice crispy feel in the beginning and it softens within a few days’ use. The manufacturer recommends washing it once in 3-5 years. You can slip a duvet cover on it to maintain good hygiene. Although dry-clean only, this can be machine washed with gentle detergent and at a very low temperature. It can be fluffier than it is when it arrives. Give the comforter some time to inflate completely. There are no duvet tabs to secure the cover over it. We wish Pacific Coast had taken note of this little detail. You can always stitch some loops yourself. This comforter is the kind of commitment you make for 5-10 years. Every time you take it out of the wash it comes back fully lofted and soft. The down doesn’t leak and doesn’t seem to lose its warming capability over time. The Pacific Coast European down comforter feels extra comfortable because it’s such a bargain. This is true hotel-quality plushness we talk about. It is made in the USA. The quality is better than you expect from the price. The filling amount is regulated to give you a year-round comfortable performance. Warm sleepers, cold sleepers, moderate winters, summers, it fits all kinds of scenarios. The manufacturer backs up the product with a 10-year warranty too. The few extra inches of the Queen size are not lost on us. The Wenersi Premium white down comforter will bring you the decadent feeling of being lost in cloudy down. The heavy-duty but lightweight comforter achieves a rare feat. It’s not difficult to handle but it can get real warm and even fight the temperate winters. The choice of sizes ensures it fit everybody’s beds. The high fill power and high quality shell indicate how well-equipped this comforter is. It earns a well-deserved place in the most comfortable down comforters list. The Wenersi Premium down comforter is stuffed with a mix of down and feathers. This includes 75% Siberian white natural down and 25% down fibers. The 700+ fill power will put to rest any of your doubts about its warming capability. The Twin size measures 68” x 90” and carries 35 ounces of fill. The Queen size is 90” x 90” and has 45 ounces of the filling. The King size goes for 55 ounces filling at 106” x 90”. It uses true baffle box construction that helps retain the heat and the fluff. This comfortable down comforter has a 600 thread count shell of cotton. The material is down-proof and hence prevents down allergy. It is soft and agreeable for long-term contact with the skin. The borders are done with royal blue piping. This protects these sensitive areas against abrasions and makes for a nice design. Its double needle stitch prevents down leakage. But we suggest using a duvet cover. The down used here is of premium quality and requires to be dry-cleaned. It’s easier to wash the duvet cover more frequently than dry-cleaning the whole thing. Wenersi makes it easy to latch on a duvet cover to this down comforter. There are 8 tabs on the comforter to attach a duvet cover. These are discreetly sewn so that you can use it without cover too, if that’s what you decide. The Wenersi Premium white down comforter feels exactly like its name indicates: premium. The baffle box construction has been pulled off well. Even upon arrival it feels plush. From there it gets fluffier within a few days. The mix of down and feather gives it a nice springy feeling without making it too hot for moderate weather. There might be some small odor to it when it first arrives. Airing it out will solve this issue. We characterize this down comforter as moderate to highly hot. We would not suggest it for temperate summers. On the other hand, it can combat a harsh winter well. The Puredown white goose down comforter is a classy-looking piece with its contrast border. Puredown invests in both warmth and the looks of this comforter. This is a moderately high fill power, moderate fill amount bedding which can be used through the cycle of the seasons. The top-notch construction ensures you don’t inhale down just by being in the same room as it. The reasonable price seals its place in the most comfortable down comforters list. 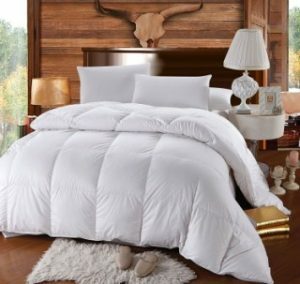 The Puredown white goose down comforter is style with substance, with the substance in this case being white goose down. This makes up 75%+ of the fill with the rest being feathers. The 600 fill power is combined with moderate fill amounts of down. The Twin size measuring 68” x 90” has 28 ounces. The Queen size at 90” x 90” has 37 ounces. The King size at 106” x 90” has 44 ounces of down. 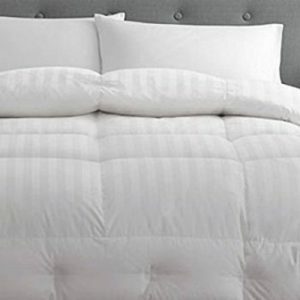 The shell of this comfortable down comforter is 100% cotton with 500 thread count. This strikes a nice balance between breathability and softness. It also locks the down inside effectively. The borders are done in golden sateen cotton. This combines with the striped design of the comforter for an elegant look. There are tabs at the corners to secure a duvet cover. This Puredown comforter uses baffle-box design. So it remains plump year-round. Even if it arrives a tad flattened, it inflates to full fluffiness within a couple of days. It is necessary to dry-clean this comforter once in a while. Machine-wash is not recommended. It needs to be aired out in the sun initially in case you smell any bad odor. It’s from remaining in the packaging. The Puredown white goose down comforter is a lightweight layer. You won’t have to heave and tug it on the bed like some heavy blankets. But it feels soft and welcoming. It is much warmer than it initially looks. You can use it through the subtropical climate. But it can get warm for the hot summers and springs. This seems to be highly durable since we haven’t heard any reports of down escapes. It’s best to select the seller recommended by the manufacturer to receive quality products. Some users have tried dry-cleaning it with successful results. But that’s entirely on your own risk. We suggest using a duvet cover since that is much easier to clean. The Royal Bedding Siberian goose down comforter actually lives up to its name. It does feel royal. The plush feeling of this high fill amount, high fill power comforter speaks for its quality. It lies in the moderately high price range but it’s still quite affordable for the top-notch features. It commands a place in the most comfortable down comforters list. 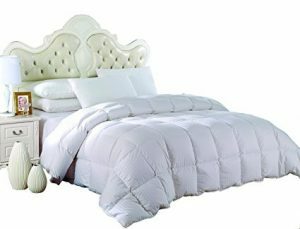 The Royal bedding down comforter flatters us with 100% filling of Siberian white goose down. Combine it with the 750+ fill power and you have the ultimate cozy machine. The Twin size measures 68” x 90” and has 40 ounces of fill. The Queen size measures 90” x 90” with 50 ounces of fill. The largest size, King, is 106” x 90” and carries 60 ounces of down. The down is locked into baffle boxes. This premium construction method ensures that the warmth is uniformly distributed across the comforters. And it also keeps the down from piling in the long run. The 500 thread count cotton shell of this comfortable down comforter is down-tight. It lets air travel through from keeps the down from leaking out. It is also hypoallergenic. The edges of the shell are gusseted for maximum warmth. The manufacturer recommends dry-clean only for this comforter. To fluff it to its full size you can run it in the dryer at no heat with some tennis or wool balls. Since this is a premium comforter, be doubly aware of who you are buying it from. Royal Bedding recommends buying from Royal Hotel manufacturer only. The Royal Bedding down comforter feels like an all-seasons comforter to us. It is warm but just enough. It doesn’t torture the hot sleepers with its warmth in the summer season. The 550 thread count of the shell is moderate so it allows proper ventilation for the hot sleepers. The amount of filling makes it automatically fluffy. It can work in summer to moderate winters. For colder winters we would combine it with an additional layer underneath. The Sheone All-seasons lightweight goose down comforter offers excellent value for money. This is a medium- warmth bedding that can adapt to the extreme temperatures with some alterations. The high thread count and high fill power ensure that you get more warmth out of this lightweight layer than you expect. It is designed to be healthy and allergy-free for the whole family. It takes plunge down into the most comfortable down comforter hole. The Sheone all-seasons goose down comforter gets cozy with white goose down. This 600 fill power filling is filled up to 40 ounces in the Queen size comforter. The Queen size runs 90” x 90”. A larger King size is also available in this collection. It has a pure white design with double-needled edges. This ensures that down does not pop out of the edge of the comforters. There are duvet tabs on the corners which can be used to tie down the duvet cover. The shell of this comfortable down comforter is made of high thread count cotton. This is down leakage-proof and hypoallergenic. It is also resistant to bacteria and dust mites. Manufacturer recommends dry-cleaning or professional laundering for this comforter. They stipulate that with duvet cover, it only needs to be washed once in 3-5 years. There may be a slight smell upon arrival which can be aired out. Run it in the dryer at a low temperature with some wool balls for full fluffing. The Sheone all-seasons goose down comforter is light and warm for the whole array of seasons. The shell of the comforters breathes pretty well. So even the hot sleepers find some respite under it. You can add a layer under it for the winters or take off the duvet cover for the summers. This is not a noisy comforter. So you don’t have to listen to it crackle when you move it around. This is a high value for money comforter. The workmanship speaks for the durability of the layer. Topsleepy Luxurious goose down comforter is an affordable option for those on a shoestring budget. This one is fluffy and comfortable just like the expensive ones. But it’s a medium warmth product that can work through all seasons. The average fill power works on keeping you cozy with a pleasant feel. The choice of sizes propels it straight to the most comfortable down comforters list. The Topsleepy Luxurious down comforter is a no-nonsense performer. It packs 50 % goose down and rest feathers. It has a plump feel that the users usually demand. It is stuffed with 500+ fill power down. There are four sizes in this. The Twin sizes is 68”x 88”, the Queen size is 88” x 88”, the King size is 102” x 90”. There’s a Californian King size too at 106” x 90”. The king size packs 45 ounces of filling. 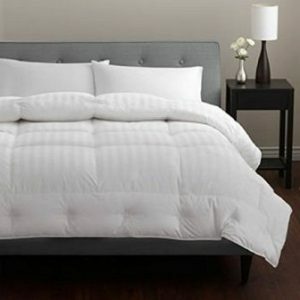 The shell of this comfortable down comforter is made of pure cotton sateen with a thread count of 300. This natural fabric is hypoallergenic. There are slim ties on the edges of this comforter to secure it to a duvet cover. It is machine-washable, a rare but welcome quality in a comforter. It may arrive a little flatter than expected but it expands to full fluff within a few days. Any odor will also dissipate when it’s aired out in the open. The Topsleepy Luxurious down comforter is designed for use in all season. It’s lightweight and warm but not enough to make a hot sleeper cringe in autumn. The fluffy feel is much more magnified than we expected at the price. It comes across as really really soft compared to other comforters at the same price. Some manual fluffing occasionally will help it stay in top shape. Taking it out in the sunshine regularly will also help it maintain its form. Pacific Coast has never disappointed us in quality and reliability. So when we saw their striped Pyrenees down comforter, we knew we had found the next product for our most comfortable down comforters list. The high fill power and moderate thread count ensure that you enjoy your warmth without sweating bucketfuls. The Pacific Coast Stripe Pattern down comforter reins in their trademark Hyperclean Pyrenees down. This is an exotic duck down found in France. PC uses 650 fill power down. They stuff 40 ounces of this into a 108” x 98” King size model. The moderate fill is to keep this comforter on for all seasons. They generously add 2” length and 8” width to the usual King size which runs only 106” in length. As the name suggests, there’s a stripe pattern along the body. The shell of this comfortable down comforter is a 500 thread count Egyptian cotton drape. It has the finest feeling we can get at this price. Pacific Coast uses baffle construction here. This traps the down in 6-sided boxes inside the comforter. This spread the heat more evenly and keeps the down from pulling a Houdini. The border is sewn with a piping to the same effect. The premium down responds best to dry-cleaning. But some users have successfully tried putting it in a front-loading washing machine in a mild cycle. It’s important to keep the temperature as low as possible. The Pacific Coast Stripe Pattern down comforter is marketed as an all-seasons comforter. The Egyptian cotton shell is highly ventilated. It puts both warm and cold sleepers at ease. It never gets too hot for the moderate temperature. But due to the quality of down, it can take you through a cold winter with a simple additional layer. Even after washes, this one feels as good as new. It is lightweight and moderately fluffy as we expected from duck down. 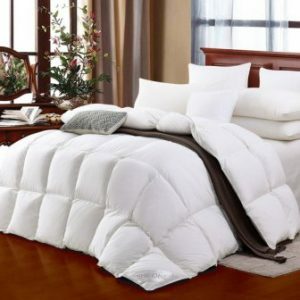 The Snowman White goose down comforter is a high performance comforter for the cold sleepers. It is abundantly filled with high fill power down. The choice of ivory color evokes feelings of being in a posh hotel. This warm and breathable bedding squished right it and fluffs up a place in the most comfortable down comforters list. The Snowman down comforter depends on white goose down and goose feather for its warmth. The manufacturer claims a fill power of a whopping 800. The King size at 106” x 90” carries 65 ounces down filling. The Queen size is 90” x 90” at 50 ounces. The Twin size demands 68” x 90” space with 45 ounce filling. The sides of the comforter are stitched in piping design to prevent any loss of down. This used baffle box construction which ensure even distribution of the down and better warmth dissipation across the body. 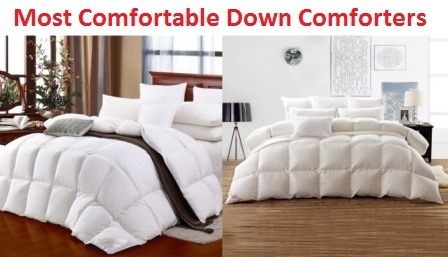 The shell of this comfortable down comforter is made of 100% cotton. This is hypoallergenic and resistant to mite. They have added anchors on the edges to tie down the duvet cover. Although not specifically mentioned by the manufacturer, we suggest professional laundering or dry-cleaning. It needs to be hung in the sunshine and hand-fluffed before the first use. 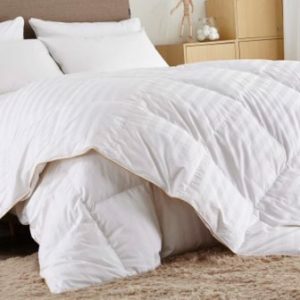 The Snowman white goose down comforter is a heavy-duty layer. The 800 fill power makes it quite warm for temperate summer. But moderate to cold climate is where it really shines. It allows proper air circulation so you don’t feel alternatively cold+wet and alternately hot in winters. It walks the fine balance of cozy warmth. This down comforter is not heavy in spite of its heating capability. It is easy to lug and has that satisfying crinkle of a brand new comforter.